correct as of 10 October 2015. 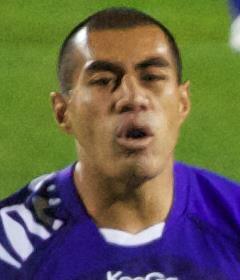 Tusi Pisi (born 18 June 1982 in Apia, Samoa) is a rugby union player who played for North Harbour in the Air New Zealand Cup. His position is fly half, but he has also played at centre and full back. He is the current first choice flyhalf for the Samoa National Rugby Union Team. After playing for the Crusaders in Super Rugby, he moved to Rugby Club Toulonnais in France for 2007/2008 and 2008/2009 seasons. At the end of the 2009 season in France, Pisi joined Suntory Sungoliath Rugby Club in Japan. In 2011, he signed with the Hurricanes for the 2012 season. On 31 June 2015 Pisi represented the Barbarians FC against an England side at Twickenham Stadium.